The two overhead camera devices are known as 'visual presenters'. 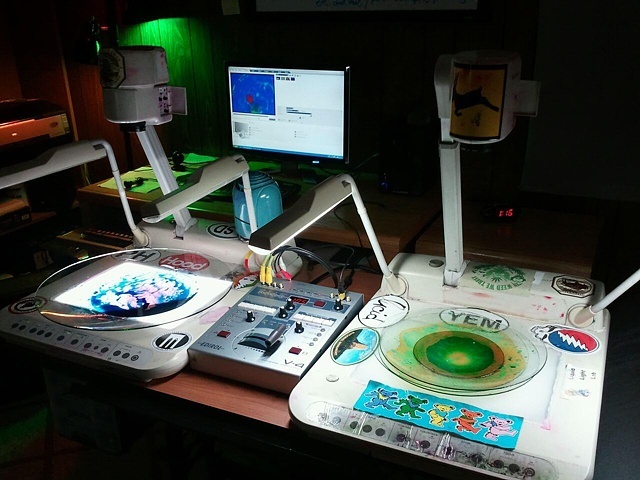 They are commonly used as teaching tools and for conference presentations, but have been commandeered here to create psychedelic light shows. The visual presenters are what light up and capture the liquids, and send them live to a video mixer. The video mixer in the middle in an Edirol V-4, a popular video an effects mixer used by VJs all over the world. The output of the feed from the V-4 goes to either digital projectors or video panels for live performance, or direct into a computer for music video production.